AUGH! ♥ I hadn’t really been looking at people’s doll sites or flickr photostreams for over a year now because it was SUCH a temptation/exquisite torture which I just could not afford (health or monetarily wise). But today I got a notification of abenohiya/hiyaya friending me on flickr and upon clicking to see if they’d be someone I would friend back I was filled with want for my own doll crew and a massive photoshoot like I haven’t had in a dog’s age. 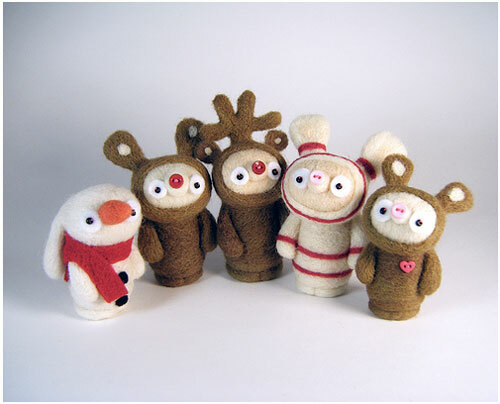 AHAHHAAA How freaken festively ADORABLE are these?!!? EEEEEEE!! Found a week or so ago, I’ve been totally squeeing over Kit Lane’s Little Oddjects etsy store pretty much daily from then. How anyone could resist her non-traditional felted cuties I have no idea, especially compounded by her terminology when titling and describing them. The very idea of bringing them home and having them have little adventures about your house overflows me with nothing short of a whimsical Sylvanian Families meets David the Gnome delight. AHAHAHAAA!!! I’m all giddy from the thought right now, and I’m just looking at the pictures!